Okay, it’s time for a break from whatever you’re doing…or procrastinating about doing. (Or is that just me?). Grab something lovely to drink. 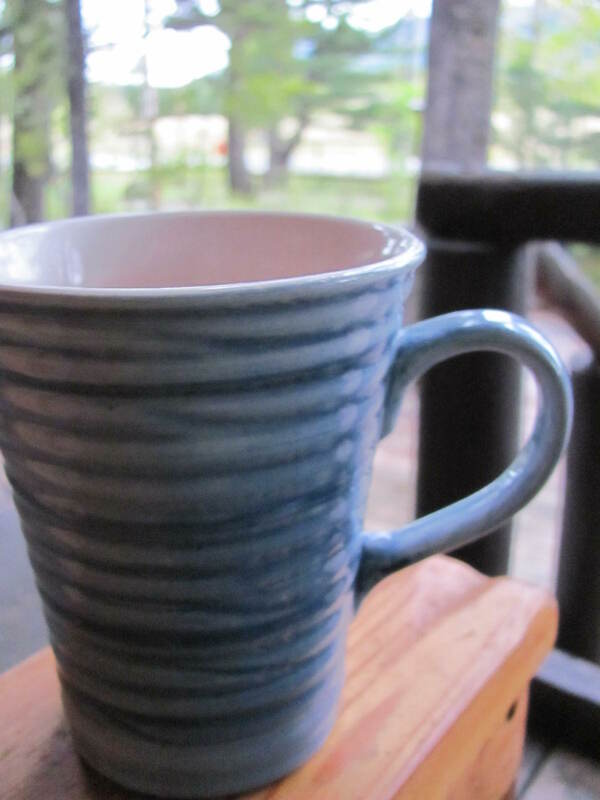 Maybe this ginger-lime refresher, or – in my case – a cup of hot chocolate (which may or may not have Bailey’s in it). (Photo may not actually depict real-time events such as ice and snow or million degrees below zero temperatures. No one wants to see that). Then a treat. Maybe a fresh-baked muffin? 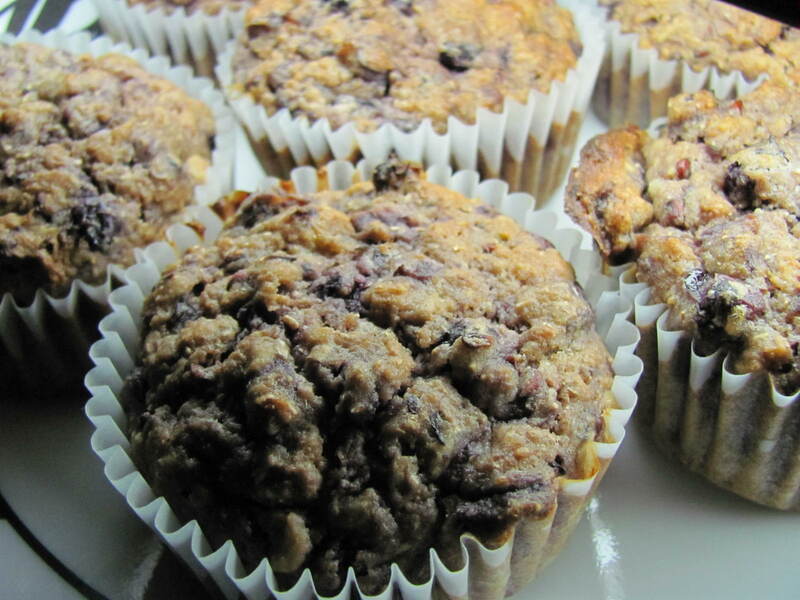 I found this recipe for Honey Oat Banana Berry Muffins on Kitchen Simplicity the other day and just had to try them. And, yes, they are as moist and tasty as you would imagine. I paired the banana with saskatoons, but you could use any berries you like. I just seem to have a lot of saskatoons in the freezer, which may be a sign that I got a bit carried away at the u-pick last summer. And finally, find yourself a good book. No, wait – an EXCELLENT book! 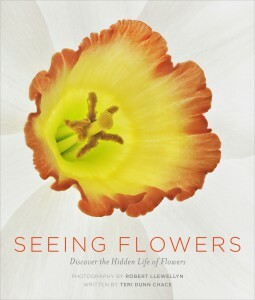 How about Teri Dunn Chace and Robert Llewellyn’s Seeing Flowers: Discover the Hidden Life of Flowers? I looked, I sighed, I drooled. (And now I’ll have to sneak the waterlogged book past my co-workers at the library). 😉 Seeing Flowers is truly a delight for weather-weary minds, and an inspiration to gardeners and artists everywhere. The book is divided into chapters based on families of flowering plants, and author Teri Dunn Chace offers a fascinating science lesson for each one, concisely describing what makes each flower look the way they do, and how flower form benefits plants. But I really, really love this book for the photographs, which look like exquisite paintings. If you’re not familiar with Robert Llewellyn’s work, you can see some of his images at this gallery. (If you browse through the website, you’ll see more, such as some of the photos he did for the equally amazing Seeing Trees, which was published in 2011). Are you seeing flowers in your garden? (At this point, I’m thinking it might be July before the snow melts here, LOL). This entry was posted in Botany, Flower, Garden Books, Gardening, Horticulture, Nature, Photography, Plant and tagged Book, Robert Llewellyn, Seeing Flowers, snow, Teri Dunn Chace, Weather, winter. Bookmark the permalink. Nothing like sitting down with a hot drink, a muffin and a good book. But I am baffled. What on earth is a Saskatoon? I always forget that I should call them “serviceberries” (Amelanchier alnifolia) instead – I think saskatoon is a common name primarily used only in western Canada. It’s funny and interesting how we have all these regional names for things. Oh right, thank you. I didn’t realise that Amelanchier berries were edible. I’ll try them when they are ready. I am ready to sit and read with you. That book looks exquisite and very interesting. Oh, and I will have a muffin, two! Firstly, your hot chocolate and baileys idea sounds amazing! If only it were a little colder here in Melbourne. Secondly, those flowers are amazing! Such detail. Really lovely photography, and of course amazing flowers! Isn’t nature wonderful!? It is, indeed! 🙂 (And I so wish we had a bit of your heat here in Alberta…it just doesn’t seem to be warming up at all!). That book really does look like my kind of book Sheryl (and hot chocolate with Baileys my kind of drink 😉 )… and the gallery you linked to is amazing! Thanks for sharing… I’ll be keeping my eyes open for either the tree or flower book. 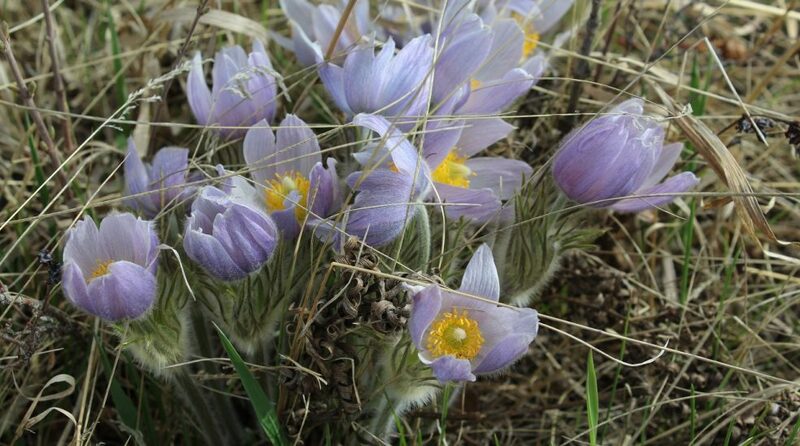 We don’t have many flowers yet here, but there are lots of signs that the plant world is waking up again at last. Both books are wonderful…I am really in awe of the photography in them. I’m so glad spring is finally arriving on your doorstep…I’m afraid we’re still in the grips of winter here. I just spent some very happy time, pretending it was spring and looking through those photos! Truly amazing talent and I think I liked the tree photos even better than the flowers. Thanks for writing about this artist! Sorry to say no flowers to be seen around here. But those muffins look delicious. I do hope the snow is melting for you, finally! You sure had your share of it this winter! Beautiful book, thanks for sharing.